Dr Previn Diwakar was born in Glasgow and grew up in Kent. He qualified in Medicine from Charing Cross & Westminster Medical School in London. He trained as a Plastic Surgeon before specialising in Endovascular Interventional Radiology at Barts & The Royal London Hospital. He is a Member of the Royal College of Surgeons of Edinburgh and a Fellow of the Royal College of Radiologists. As well as working at The Whiteley Clinic, he is a Consultant Interventional Radiologist at the Royal Liverpool University Hospital, which is a leading internationally recognised teaching hospital unit at the cutting edge of embolotherapy for the treatment of venous abnormalities and cancer. Previn has lectured at both national and international level and published peer-reviewed articles and book chapters on pelvic vein embolisation. 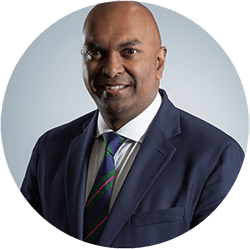 He has been working at The Whiteley Clinic since 2012 and is passionate about offering patients the best outcomes by using The Whiteley Protocol® in his clinical practise. He is married to Lisa and has a young son, Oscar. Previn is an ardent Liverpool Football Club fan and tries to never miss a match with Oscar. At home he loves cooking for friends and family.